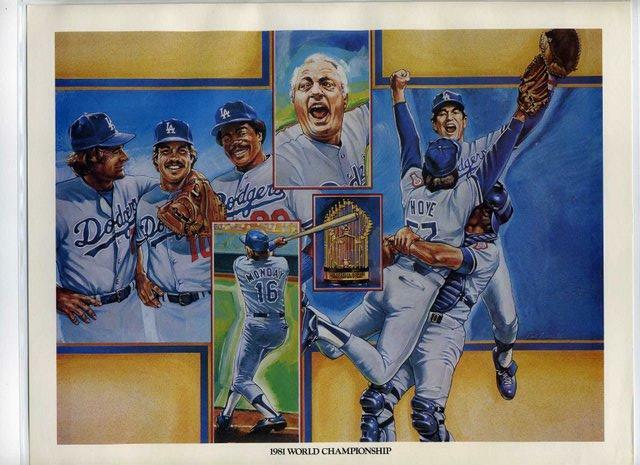 The 1981 World Series was my first experience with Dodger greatness. 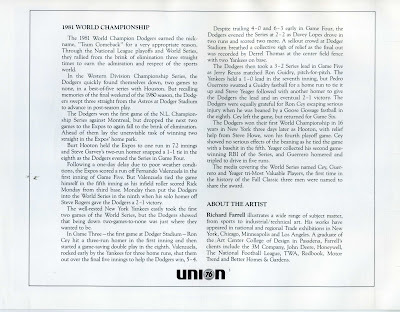 So, when I received this 1984 Union Oil Most Memorable Moments sheet that celebrates this event I was tickled. After all, who can forget the guts and determination of "Team Comeback." In the 3 playoff series that year the Dodgers came to the edge of the cliff- near elimination- only to claw and fight back to win. It started with the Western Division Series against the Astros. We fell behind 2 games to 0 in the 5 game series, but went on to win the next 3 in Los Angeles. The NL Championship series versus the Expos was just as perilous. The Expos lead the series 2 games to 1 in the 5 game set with the remaining games left to be played in Montreal. Of course, we won the last two games that was capped off by a game winning homerun by Rick Monday in the 9th inning of game 5. The World Series was a historic baseball match between the Dodgers and Yankees. It would be the 12th time these two clubs would meet in the Fall Classic. It started out the way the past 2 series started. The Yankees jumped out and won the first 2 games. Then, the Dodgers took control and won 4 straight games for their first championship in 16 years. Also, for the first time in history the series MVP was to be shared by 3 players- Ron Cey, Steve Yeager and Pedro Guerrero. Check out the rest of the set here in my photoalbum, or the following link with my post about each sheet.